A media group linked to so-called Islamic State (IS) militants has started sharing their online posts via the social media platform Baaz. The San Francisco-based service, founded in 2015, allows users to combine updates from dozens of other apps and sites into a single feed for simplicity's sake. It currently supports English and Arabic languages. Baaz told the BBC it had tackled the issue. 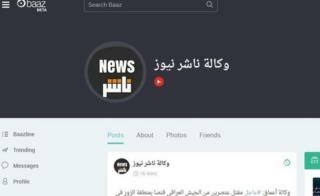 The IS-linked propaganda outlet Nashir News Agency began posting material to Baaz in the early hours of 12 June. The content included claims about attacks and images glorifying the group's activities. The outlet advertised its new Baaz account via numerous replica channels on the messaging app Telegram, which has itself attempted to restrict the Nashir agency's activities on its platform. IS's news outlet Amaq has also launched a feed on Baaz, where it started posting its own reports and videos on 5 June. Nashir News Agency, which largely distributes official IS material - including that of Amaq, proliferated on the messaging app Telegram after the group's official channels - called Nashir - went underground last August. Since late March this year, the outlet has slightly diversified its content to include calls on IS supporters to increase their efforts to get the group's message out on popular platforms such as Twitter, Facebook and Instagram. It has repeatedly set up its own accounts on the platforms, but they have been suspended. Amaq intermittently appears on other social media platforms such as Tumblr and YouTube. IS supporters have also recently shared links to an Amaq group on the messaging service WhatsApp. Baaz's website states that users can report abusive, illegal or offensive content posted on its platform via a feature that is currently available in its iOS and Android apps but not its web app. After being alerted to the developments, Baaz suspended the Nashir News Agency account. "We appreciate you pointing it out to us," a member of the firm's support team told the BBC. "We are taking immediate action, and are removing the content as well as blocking the user. "If the content contains any offensive or known Jihadi content we act immediately. Our policy and position is unequivocal, and we do not tolerate, condone, support or accept such content." Baaz also appears to have removed the Amaq account from its platform.